The Bahamian who holds two Academy Awards and a Grammy recently released a novel. 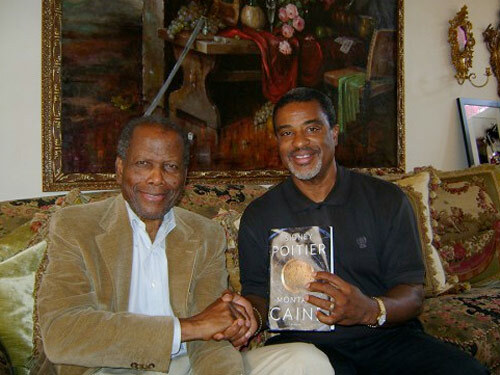 Film icon Sir Sidney Poitier with Bahamas Film Commissioner Craig Woods (right). Sir Sidney Poitier, who famously is the first African American to win the Academy Award for Best Actor, has released Montaro Caine, a fictional novel that examines the untapped potential that people have within them. He spoke about the novel with Bahamas Film Commissioner Craig Woods, who visited Sir Sidney at his home in Beverley Hills, while Mr. Woods was attending the Association of Film Commissioners International (AFCI ) Locations Show in Los Angeles, California. Sir Sidney first won the Academy for his role as Homer Smith in Lilies of the Field. He received an honorary Academy Award for extraordinary performances in 2002. His Grammy Award came in 2000 for Best Spoken Word Album, when he narrated The Measure of A Man.